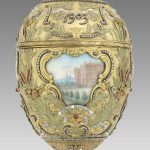 The Virginia Museum of Fine Arts reinstalls its massive collection of Fabergé objects after a world tour. Fabergé firm (Russian), Monumental Kovsh, 1889–1908, silver, chrysoprase, amethyst, 15 x 27.5 x 12.25 inches. 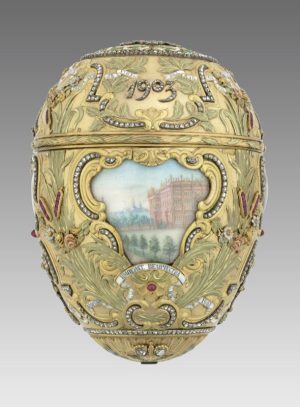 Fabergé eggs, today virtual bywords for the stratospherically rare and expensive, were once hard to sell. When the Russian Revolution ended Romanov rule in 1917, most of the Imperial family’s treasures, including thousands of decorative objects made by the firm of Karl Fabergé, were carted off to the Kremlin by the Bolsheviks. There they were stored in crates, ostensibly preserved as items of national heritage but actually consigned to oblivion for 10 years. Then, in 1927, Stalin decided that such detritus of decadence be sold to the West, so that the capitalists might help fund the socialist state while laying the groundwork for their own inevitable demise. But the Soviets picked an inopportune moment to release the Fabergé treasures onto the market. By the time they got around to it, it was 1931, the depths of the worldwide depression, and Armand Hammer, the U.S. agent for the U.S.S.R., had trouble finding buyers at any price for the 14 Imperial Easter Eggs he had on hand. To promote the eggs, Hammer took them on a tour of American department stores, showing them in elaborate displays and lecturing on their history and meaning. When some eggs were shown at the Russian Exhibition in London in 1935, the media characterized them variously as “a melancholy joke,” “Imperialism gone crazy,” and “wonderful, but, of course, not of our world to-day.” Eggs that sold at auction brought as little as $500. Seeing opportunity but also beauty, four wealthy American women collectors, Matilda Geddings Gray, Marjorie Merriweather Post, India Early Minshall, and Lillian Thomas Pratt, acquired Imperial Easter Eggs at this time. Pratt, the wife of a wealthy Fredericksburg, Va., businessman, John Lee Pratt, bought five from Hammer, paying for them on her Lord & Taylor charge card. He also sold her a range of other Fabergé pieces including animal and human figurines, picture frames, presentation boxes, and other jeweled, enameled objets de vertu. Upon her death in 1947, she willed her collection of Fabergé and other Russian decorative arts to the newly-created Virginia Museum of Fine Arts in Richmond. 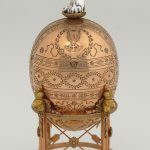 As a result, the VMFA now has the largest collection of Fabergé objects of any museum outside Russia, and its group of five eggs (out of a total of 52 made for the Imperial family) is likewise the largest outside Russia. Of the 190 pieces at the VMFA, 167 come from the Pratt collection, which comprises around 400 works. Starting in the fall of 2012, the collection went on a world tour that began at the Detroit Institute of Arts and then went on to the Peabody Essex Museum in Salem, Mass., the Montreal Museum of Fine Arts, the Bellagio Gallery of Fine Art in Las Vegas, the Oklahoma City Museum of Art, and, for its last stop, the Palace Museum in Beijing, where it closed on July 17 of this year. 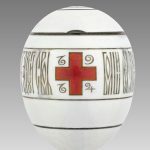 The five Imperial Easter Eggs on display at the VMFA—the Rock Crystal Egg (1896), the Pelican Egg (1898), the Peter the Great Egg (1903), the Tsarevich Egg (1912), and the Red Cross Egg (1915)—are anything but square. 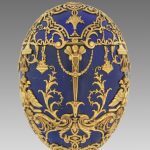 Sharing the basic egg shape but otherwise diverse in design and finish, they celebrated the Orthodox faith as well as commemorating specific events in Russian history and the lives of the Romanov family members. 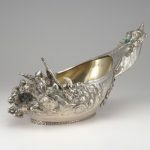 Among the other Fabergé objects in the show are a circular Imperial presentation box ornamented with nephrite, gold, and diamonds; a six-pointed star-shaped picture frame of gold, enamel, pearls, gold, and ivory; a hardstone statuette of an Imperial Navy sailor; a dandelion sculpted from rock crystal, gold, diamonds, and asbestos fiber; and a monumental kovsh, or traditional Russian drinking vessel with a boat-like oval form, made of silver, chrysoprase, and amethyst.